I started running in 1974 during a complicated and difficult divorce. I had never run before, but that exercise got its start at one of the earliest Sound to Narrows events, when I bent to tie the shoe of my year-old daughter. The starter’s gun went off, I looked up and watched as the runners took off and said to myself, “I could do that.” A year later, I competed in my first Sound to Narrows race. I ran in the morning before I went to work. I ran on my lunch hour. I ran after work sometimes in the dark. The exercise that ended up saving my soul also put wear and tear on my knees, and so, after 25 years of running, I again hit the pavement. This time I was walking. Checking in with a doctor before undertaking any exercise is always a good idea. For walking, good-fitting shoes are a must, and gloves and hats for cooler weather. I always carry a hand-held spray for safety reasons, although I have used it only once on a dog that was growling and baring his teeth as he charged me. Experts hail the benefits of walking and the fact that it is so much better for muscles, joints, back and knees than running. The health benefits of walking are obvious. Lowering cholesterol and thus heading off heart disease, keeping joints moving and even helping to avoid cancer and diabetes are just some of the benefits. Some walkers report being able to toss their medication after undertaking walking on a regular basis. Before the stores at South Hill Mall in Puyallup open for business, walkers are welcome and encouraged to come in and enjoy the fun. 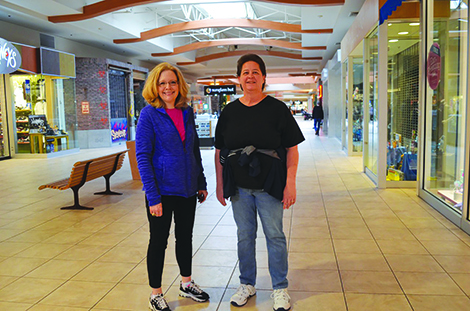 Daniele Ledvina and her walking partner Sarah Manley met at work 20 years ago, and they frequent the mall on rainy and cold days for a three-mile walk. On dry days, they hit the Riverwalk Trail for time to visit, as well as get in their daily exercise. Also at South Hill Mall on a regular basis are moms with strollers, part of the Fit for Mom Puyallup group. Coach Bree Chapman takes the moms through their paces as they walk throughout the mall, stopping to use exercise bands, do hammer curls and sing songs to entertain the children. On any day, walkers at the Mall will see couples holding hands and singles listening to their tunes. Many walkers prefer the outdoors. Jill Barrett, Lynn Hamilton and Donna Paul walk throughout downtown Puyallup with their dogs, which gives them time to catch up with each other and give their family pets a good workout. Marion Hale and Virginia King are members of American Association of University Women, a non-profit group whose purpose is to empower women and girls. In addition to the good work that AAUW does, they meet weekly to walk at local parks and trails. “The walking group started about 10 years ago. It is so important to exercise, but mostly our walks are social,” said Hale. One of the things that keeps the walking group fresh is that they meet at a different venue for their weekly walks as often as possible. “In the summer we walk on (Tacoma’s) Ruston Way and end the walks with lunch on the waterfront,” said King. Joan Cronk, who wrote this article, is a freelance writer from Puyallup, where she is seen walking virtually every day. BPA Trail: Connects downtown areas of Federal Way with Celebration Park. Paved, 3.5 miles. A trailhead is at 1610 SW. 356th St. Bud Blancher Trail: Trailhead is in Eatonville, just off Center Street East. Views of waterfalls and Little Mashel River for 2.5 miles on gravel surface, eventually connects with Pack Forest. Des Moines Creek Trail: 2.2 miles, paved. Parking at trailheads in Des Moines Creek Park (2141 S. 200th St.) and Des Moines Beach Park (22030 Cliff Ave. S.). Foothills Trail: 21 miles, paved, through Puyallup, Orting, South Prairie and Buckley, with a trailhead in each community. Scenery along the way — farmland, forests and Mount Rainier. Information: piercecountywa.org/1384/foothills-trail. Interurban Trail: 18 miles is mostly flat from its start at Fort Dent Park in Tukwila through Kent, Auburn, Algona and Pacific. A 2.5-mile section descends from Milton toward Tacoma through the forested canyon of Hylebos Creek. Information: traillink.com. Nathan Chapman Memorial Trail: Pierce County Parks and Recreation’s paved loop through forested area is accessed at 14201 86th Ave. E. or at Heritage Recreation Center in South Hill. Puyallup Riverwalk: Five miles from Puyallup’s westerly city limit to the East Main/Puyallup River bridge near Sumner. Information: cityofpuyallup.org. Ruston Way: Two-mile paved walkway along waterfront of Tacoma, with views of Commencement Bay. Information: metroparkstacoma.org.